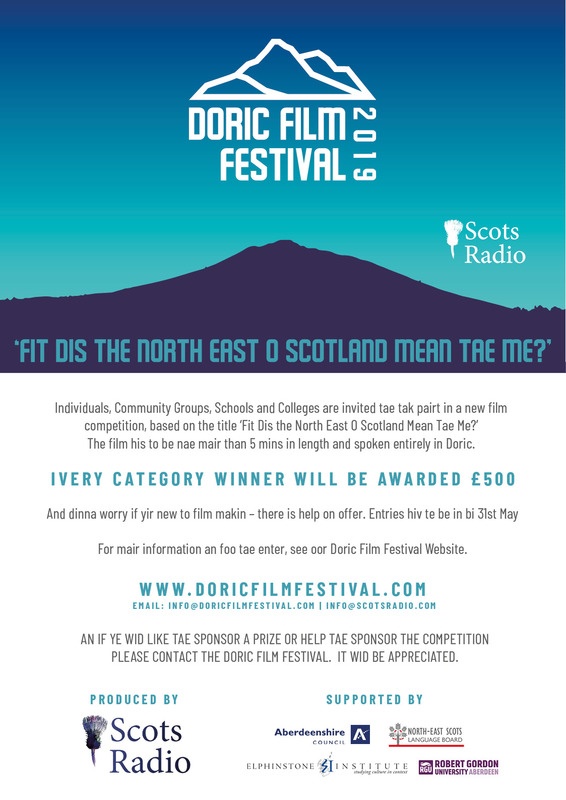 The first ever Doric Film Festival has been launched to celebrate and showcase the vibrancy of north east culture. If you are a budding film-maker or part of a community group, a school, young or old then the festival would like to encourage you to enter the film making competition. Each film must be no longer than 5 minutes, with all dialogue and text in Doric or north-east Scots. The best submissions will be premiered at a red-carpet screening at the Belmont Filmhouse in May 2019. You don’t have to be an experienced film-maker to be a part of this inclusive film festival. Training in pre-production, storyboarding and editing will be offered to those who require a support. The festival has been set up by Scots Radio and supported by North-East Language Board, Elphinstone Institute, Robert Gordon University and Aberdeenshire Council.